The Source Audio Programmable EQ is a modern upgrade to traditional equalizer pedals for guitar and bass. With hands free switching of four user programmed EQ settings, 12db of volume boost and is midi controllable. When setting a preset, each of the seven frequency bands can be boosted or cut by 18dB. The volume of each preset can also be saved with a boost of up to 12db for either a transparent volume boost or to push the front end of the amp for a natural breakup. An additional frequency band at 62Hz is accessible via the Octave Extend function, engaging this optimizes the pedal’s frequency spectrum to accommodate the specific frequency range of the bass. 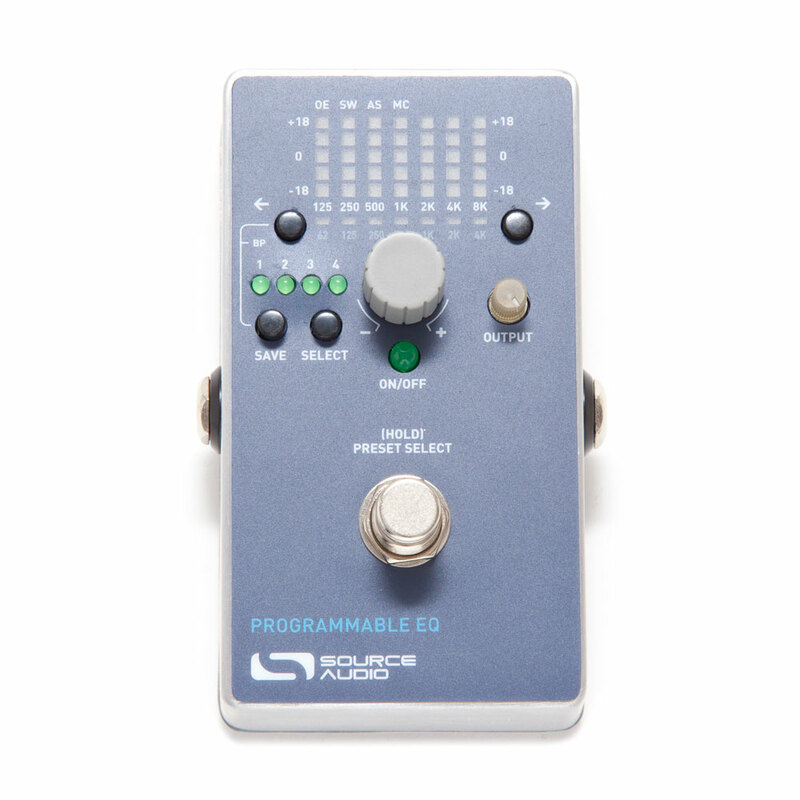 Each preset is easily accessible via the hands-free footswitch scrolling function. Simply hold down the footswitch and let the pedal scroll through each preset at an adjustable rate, then release to select. As a bonus, the Auto-scrolling function cycles through all four presets at an adjustable rate creating a tremolo style effect. The pedal’s MIDI input also provides remote access to user presets or engages/disengages the pedal. Run a MIDI signal from your POD, Eventide Space reverb, TC Nova System or any other MIDI compatible multi-effects unit and vastly expand your tone horizon within each preset.